Swedish wunderkind Per Götesson was given the opportunity to present his Fall 2018 menswear show in the environment it would eventually end up in eight months later: the Machine-A. 13 Brewer Street, in the heart of Soho, houses the standalone boutique, founded by Stavros Karelis and co-run with stylist Anna Trevelyan. Karelis headhunts fresh talent from around the globe and stocks emerging brands exclusively in the store. 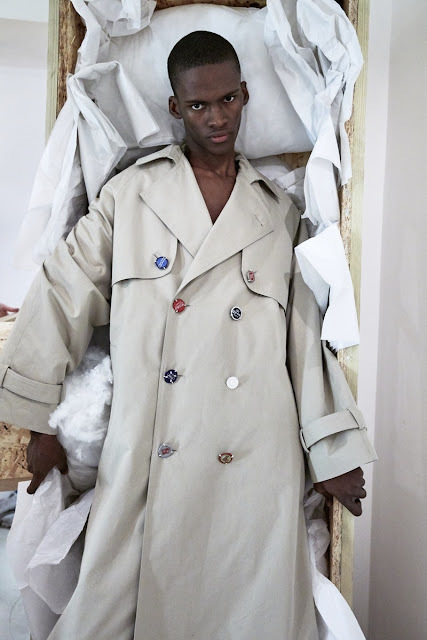 One of them is Per, a recent graduate from the menswear programme at the Royal College of Arts and the incubator facility MAN, under Lulu Kennedy’s renowned tutelage. “I wanted to explore notions of modern masculinity,” he declared. It has been something which has formed the basis of his work, with four seasons under his belt now. He subverts conventions and his output is rather captivating, colourful and creative. He distinguishes himself from the gender-defying menswear movement by specialising in oversized and undersized garments which create these unconventionally stylish moments—it’s akin to a painter’s trousers, distressed with paint drops and colourful smears, his clothes belong to the creatively-inclined. He based his fall study on “attraction, sexuality, desire, what is concealed and what is revealed.” Sensuality rested at the surface without becoming overt. Götesson expressed himself in familiar terms—oversized trenches for covering up, a decortiqué lilac sweaters (Galliano, the trend disseminator) showing off. There was something so casual, yet so beautiful, in the way an oversized safety pin was used to gather a sweater, or the slight sheerness of printed shirts. Each of the looks were placed within plywood frames, stuffed with fabric. 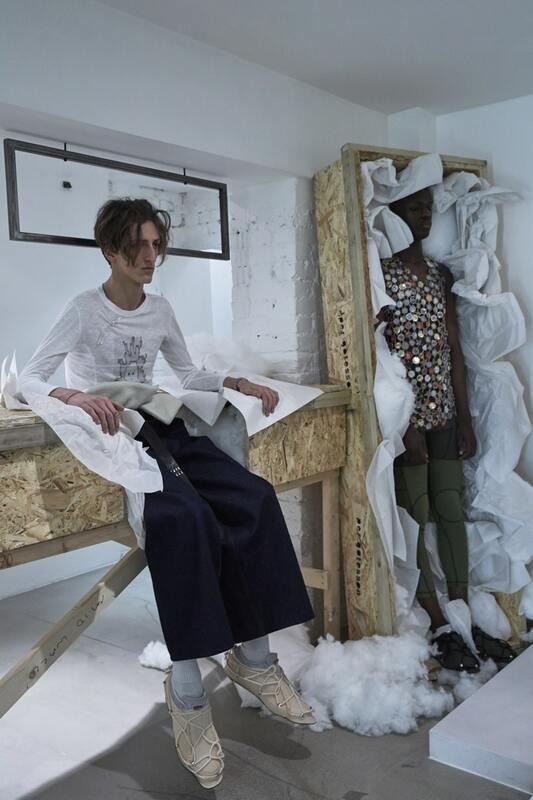 It placed fashion in an artistic context, the way Faustine Steinmetz did in the beginning. By situating the show in a store, as opposed to the museum or gallery venues Steinmetz had over the years, Götesson’s creative realm collided with the commercial realm. It was believable. 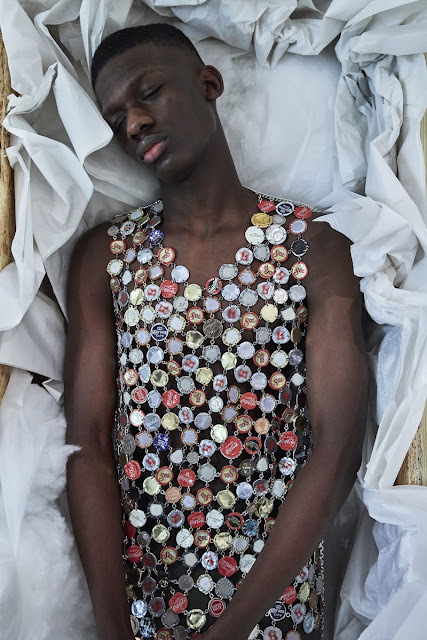 One vest was comprised of bottle caps. Coca-Cola. Diet Coke. Alcoholic beverages: Sol, Corona. Cheap and cheerful. (In 2016, he told i-D, “there is always time for a couple of pints.” Clearly.) These were handcrafted by Husam el Odeh, a German fine art graduate based in London. He was also responsible for the silver wire tiara which adorned a model’s crown, encased in a wooden frame. These pieces, although crafted from metal and wire, were the most delicate which is a gesture towards modern masculinity if anything. 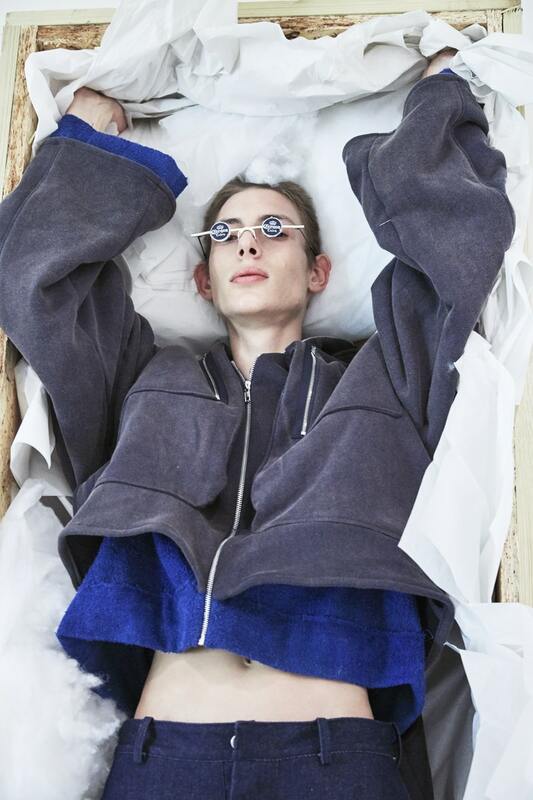 They were worthy of an archive, but also they possessed an innate ability to be translated into something more commercial which is the biggest challenge facing experimental menswear designers nowadays.